London: 14/11/18 – Kaptivo, a disruptive and innovative brand in the UC market, is working with Nuvias to make its whiteboard collaborative solution available throughout the EMEA enterprise market. 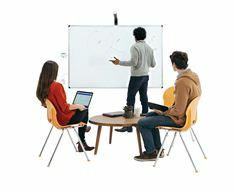 The Kaptivo whiteboard collaboration system lets customers digitise their existing, dry-erase whiteboard and live-share it with remote users. It leverages the familiarity of the traditional whiteboard, requires no special pens or equipment and works with a single button press. The Kaptivo solution integrates easily into conferencing systems, including BlueJeans, Dolby, Polycom and Lifesize, already key parts of the Nuvias UC vendor portfolio. This enables Nuvias to offer bundled, easy-to-deploy business solutions to channel partners across EMEA. Nuvias will support channel partners with additional services, including the integration of the kit into pre-packaged conferencing solutions.